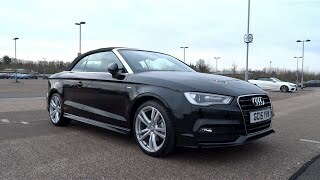 Audi A3 Cabriolet Sport 2015 is a step taken by Audi to cover the wide market of automotive buyers, offering them power of their choice without making any compromise with the Audi comfort and features. This latest release as per the company’s officials will surely make a remarkable presence not only in market by making sales but will also make an eternal space in the heart of its buyer. Let’s have closer look at the specifications and features offered. The interior of Audi A3 Cabriolet Sport 2015 is very much identical to its hatchback sibling however new design has been noticed in steering wheel and seats. Low positioned instrument panel gets a little curved front while the center console gets little inclined towards the driver’s side. Enough of space has been provided in interior for four adults however for the ride of two, A3 Cabriolet Sports offers you an option to bend fold rear seats to front, thus providing more space for luggage. Buyer gets series of options to choose and make his/her Audi A3 Cabriolet Sport more personal and futuristic. Options like drop top with information system, adaptive cruise control, camera based traffic sign recognition etc. Apart from these also topping the list is a MMI Navigation plus with a super-splendor 7-inch monitor and Bang and Olufsen sound system. Exterior of Audi A3 Cabriolet Sport follows the trend created by its recent siblings. The pattern gets noticed majorly in creating grille, headlights featuring horizontal design and bumper encapsulated with large air intakes to cool brakes and engine. However a step apart gets with the option of installing LED headlights offering leveling control feature. The rear aluminum frame for windshield and trim strip running around makes the exterior of Audi A3 Cabriolet Sport look more gorgeous. Light weight soft cloth built rooftop opens in just 18 seconds and holds a rear glass window with it. Also buyers get an option to choose between 16”-19” wheels mounted with powerful brakes. 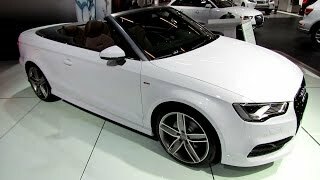 Audi A3 Cabriolet Sport comes with series of engine options; in gasoline, range begins with a 1.4 liter TFSI delivering 140 hp and 1.8 liter TFSI throwing 180 hp and in diesel a 2.0 Liter enthralling 150 hp. News say that soon diesel range will be added with a 1.6 Liter TDI with power output of 110 hp and also a 2.0 liter TFSI delivering 300 hp. Talking about the transmission statistics, the 1.4 liter TFSI and 2.0 TDI are paired to a six speed manual transmission while the 1.8 Liter TFSI mated to seven speed S tronic transmission.